So Leinster give another side a right royal pasting in the RDS – no surprises there I suggest. 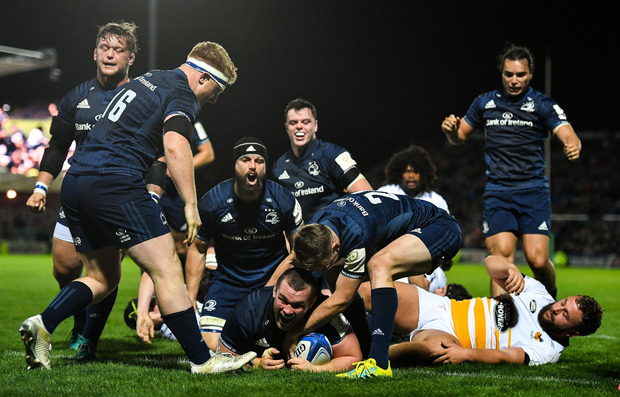 This time it was those former high-flyers in Europe, Wasps, who suffered at the hands of a ruthless Leinster team that in the second half pulled out all the bells and whistles in an emphatic six-try second period that humiliated the London visitors. Wasps’ highly-paid All Black Lima Sopoaga will not look back at his European Cup debut with pleasure after a yellow card on the stroke of half-time allowed a rusty Leinster to take firm control, scoring 14 points while the New Zealander chewed gum on the sidelines. In fairness, Sopoaga was a little unlucky when not only did the pass from Leinster look borderline, but his resulting blockdown just failed to qualify as a legitimate intercept as he juggled the ball with his fingertips. Like the unforgiving All Blacks trademark, Leinster struck on the stroke of half-time, and then, more damaging for Wasps, scored straight after the break when merciless winger James Lowe burst into a gap where Sopoaga was meant to be. The rest is history. In the second half Leinster were magnificent, and moments to savour included the sight of barrel-chested Tadhg Furlong stepping and then offloading with all the poise and style of a midfield back. Then a moment of awe when Wasps pushed up on Johnny Sexton flat and offside but, rather than panic, Sexton calmly pulled off the perfect cut-out pass from between his legs for his side to score. It was magical. In the first half Leinster did not have it all their own way. Wasps, to their credit, dug in defensively but the flattery on the scoreboard at just 7-3 was more due to Leinster’s mistakes in the Wasps scoring zone. Leinster owned all the possession, almost 70 per cent of it, and built phase after phase well, but just when it looked like they were certain to score a Leinster player knocked on or turned over the ball. Wasps had a couple of chances, especially when Willie le Roux over-cooked a couple of cross kicks for his wingers to chase on to. So, with 39 minutes on the clock and Leinster just a try to the good, Wasps were somehow well in the game. Cue Sopoaga’s yellow card and a shift in momentum. Leinster went searching and at half-time, instead of being just a few points up, they had two tries in the bag and enough of a lead to kick on. Leinster is one team you don’t want to allow a points cushion and 30 seconds into the second half, home hero Lowe, who has the widest smile and whitest mouthguard in world rugby, showed it all off after he celebrated with a superb individual try. The floodgates followed with Leinster making a show of the Wasps defence. Leinster were great and we can take nothing away from a wonderful performance, but Wasps also contributed to the 50-point scoreline as they fell off tackles and had their underbelly tickled. Wasps’ line speed mid-way through the second half was almost non-existent. It seemed they had given up, which is a disgrace. For any coach or opposition player, seeing the likes of Jack McGrath, Sean O’Brien, Scott Fardy, Andrew Porter and others coming on to continue the battering must be depressing. On this form the challenge for Leinster may only come from the French teams, who seem better equipped to deal with the Irish threat. The English game has become one where the talent is too thinly spread and there are too many average players swelling its ranks. Just look at all the top English sides who struggled against the Irish provinces last weekend. I know Leo Cullen wants us to put a lid on this season’s expectation, but a 50-pointer against a former European winner while easing up? Leinster supporters can save their worries to the later stages and, despite Toulouse being a testing away game, a win in France will ensure Leinster can take control of their group.